Things have change a lot in ten years, Jason owns a bar and lives an almost secluded life, and Robb is healing from war wounds that are both physical and psychological. When Jason has a hilarious, albeit dangerous, accident with a huge Christmas ornament, Robb rescues him and takes him home, which forces them to spend some time alone and confront all the heartache and pain that remains between them, and maybe give their relationship a second chance. I had such a good time reading this book, it was entertaining, romantic and very touching. Ms. Gregg was able to tell a poignant story about heartbreak and forgiveness in a very positive and uplifting way. It had some humor and lightness to it despite dealing with an issue as serious as PTSD. Obviously what made this story such a good one were the characters. It had two very typical guys that we often find in romance novels: the cranky guy who had a crappy childhood and has relationship issues, and the rich guy with the crazy but loving family who went to war and came back a different man. But the way the book is written it doesn’t feel common and the almost irreverent and fun way in which the story is told gives it an unique touch. My favorite part about the book, and the aspect that gives it a lot of authenticity, was the fact that there’s no easy solution to Robb’s problem, he knows he’s in no shape to be in a healthy relationship and so he decides to take some time to heal first. 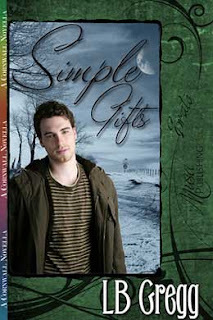 I give kudos to the author for doing it this way because Simple Gifts is a Christmas story and we all know that miraculous recoveries are the norm in books like this, but Ms. Gregg doesn't take the easy way out and instead delivers a very believable ending that's completely satisfying, especially because it’s oh so romantic! It is a short novella and it might have been better as a full-length novel, but the short format works and it makes this the perfect holiday read for people without much time on their hands. Fans of romance should be happy to read this story because it has great characters to root for, a bit of comedy, depth and paper cranes. Newly returned from years away in the military, Robb's homecoming isn't exactly the stuff of fairytales. Now thrust together after a ten year hiatus, the Jason and Robb discover that perhaps some things are worth waiting for. Musa Publishing; November 24, 2011. Now I want to know what happened with him and the Christmas Tree ornament. Jason and Robb's story sounds interesting, especially knowing that they actually have history with each other. Nice review as always. You changed your pic! I love this one, is more you (obviously, LOL). Brie you always read books that make me so jealous of you. This one sounds fantastic.